What are the Holland and Jagger Blue Light Blocking Glasses? Have you been recently experiencing headaches, strain around the eye sockets or your temples? Perhaps having trouble sleeping as well or waking up feeling more tired than when you went to bed? If you think all these symptoms fit with what you are experiencing, then high chances are that you have become a victim to harmful UV blue light rays which are emitted from digital screens all around us! While we can try to avoid them as much as possible, we can’t fully give them up at any cost! You need Blue Light Blocking Glasses, and with the Holland & Jagger Blue Light Blocking Computer Glasses you can use your gadgets with screens in a stylish manner in multiple environments without worrying about getting affected by these high intensity UV blue rays! 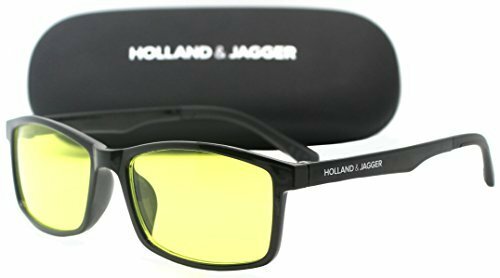 Holland & Jagger Blue Light Blocking Computer Glasses—FDA Approved—Sleep Better, Reduce Eyestrain & Fatigue When Gaming, Tablet/Phone Reading, TV—Anti Glare Eyewear Men and Women (PC Black). The unisex design of the Holland & Jagger Blue Light Blocking Computer Glasses makes them not only unique and outstanding but also eliminates the possibility of looking out of place. Overall, the frame of the glasses is made from acetate material which is a flexible, sturdy and environmentally friendly alternative to petroleum-based frames. While the manufacturers claim to have multiple colors in this design, the ones most commonly bought feature a black and crystal combination which not only looks stylish but also very modern! Moreover, the nose pads of the glasses are also crystal in color which means that they easily hide within the normal complexion of the individual. Since the acetate material is known to be lightweight, the nose pads as well as the rest of the frame in general don’t apply too much pressure on the nose bone or the temples and sit lightly over the users’ face. The unisex design of the frame fits well on multiple different face shapes and in most instances also accentuates the face structure! Perhaps the best feature of the glasses is the orange tinted lenses. This feature of the Holland & Jagger Blue Light Blocking Computer Glasses results in high performance and is well built. 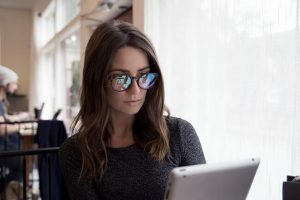 In terms of blocking harmful blue rays emitted from screens, the lenses are built to block over 98% of them to protect the eyes and reducing overall strain on the users’ health. Consequently, in terms of make, the lenses have been coated with 9 different layers to ensure their longevity as well as enhance overall performance. For instance, some of the known coatings include, anti-glare, scratch resistant and antireflective. The 9 coatings on the lenses of the glasses don’t make them bulgy or heavy. The lenses don’t feature magnification. The acetate material of the frame is easily re-adjustable if it becomes de-shaped after some time. The frame is flexible and will easily fit on different shaped faces. The lenses are built to filter out majority of the blue light rays without compromising on clarity of vision. The lenses feature a light orange tint which significantly reduces distortion of color. The glasses have a robust structure which ensures longevity. 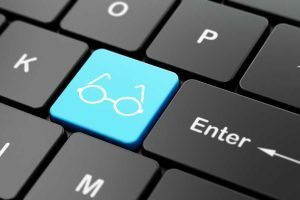 The glasses don’t feature magnification lenses and are not suitable to be used as regular reading glasses. In all a pair of Holland & Jagger Blue Light Blocking Computer Glasses is the perfect combination of stylish and high-quality! When it comes to protecting your eyes from getting effected by harmful blue UV rays, the glasses do the job at 98% in comparison to other similar glasses which barely hit a close 78%! 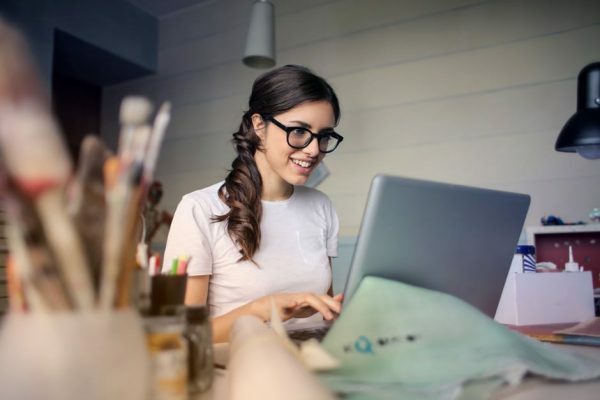 The high level of blocking allows for better performance in your work as your generally functioning is made better without the occasional head aches and sleep issues! Design wise, the unisex feature makes sure that users with different face shapes can easily and conveniently wear the glasses as the acetate material used in the frame is flexible and will accommodate different head sizes easily! 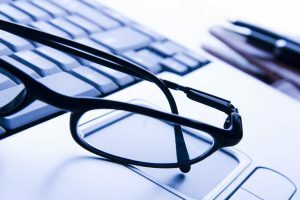 In comparison to other glasses in the same area, the Holland & Jagger Blue Light Blocking Computer Glasses performs much better due to its high-quality features and versatile design. 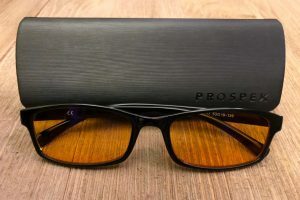 For instance, when compared to the SPEKTRUM PROSPEK – Premium Computer Glasses it was found that there were significant differences in terms of not only the number of blue rays blocked but general design and comfort levels. On first look, one will find that both frames are extremely stylish and good looking. Both feature a rectangular black frame with crystal or burgundy overtones respectively. 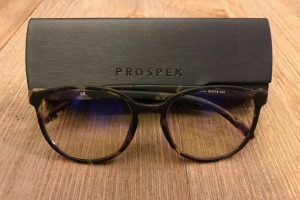 However, the Spektrum glasses offer a more retro look compared to the professional yet stylish look of the Holland and Jagger computer glasses. Moreover, in terms of the built of the frame, the Holland and Jagger employ an environmentally friendly material known as Acetate which can be flexible and much more lightweight compared to its petroleum plastic counter parts. The Spektrum ones use polycarbonate material which is not as lightweight and more susceptible to damage in high temperatures! 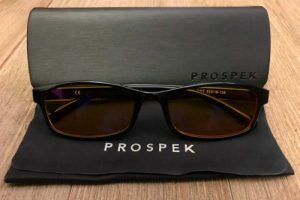 Moving on to the lenses of the glasses, the user will notice that the Spektrum ones feature a clear lens as compared to the orange tinted ones of the Holland and Jagger glasses. While both have a different overall look because of this, the clear lenses of the Spektrum are built to only block 50% of the harmful blue rays while the lenses of the Holland and Jagger tend to block 98% of these rays with minimum color distortion as well! Consequently, at the same time both have lenses with multiple coatings for durability and enhances performance! These include antiglare, scratch resistant, antireflective and even anti-fog! Therefore, in the end it all comes down to the user’s personal preference! 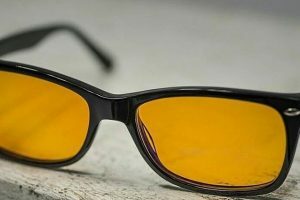 If you are an individual which is looking for zero color distortion at the expense of more blue rays hitting your eyes, then you should opt for the Spektrum glasses. However, if you are more concerned about your general health and its detrimental falling due to these rays, then you should go for the Holland and Jagger glasses because in terms of overall design both glasses are great looking! Even if you are not an avid gamer or don’t require to be seated in front of a digital screen for long hours, doesn’t mean that you don’t use screens at all during your day! Whether you are on you phone before hitting the sheets or like to read you’re an e-book in bed, chances are you are exposing your eyes to harmful blue light radiation which means that you ought to do something about it! The Holland & Jagger Blue Light Blocking Computer Glasses offer a great simple solution to your eye health-related worries. The glasses are built to block blue light radiation to make sure your circadian rhythm stays intact, and you can sleep fully throughout the night. Consequently, they also make sure your eyes experience minimum digital strain and headaches that are a leading cause of high exposure to blue light!